Super Bowl Champion New England Patriots were in Washington on Thurs. 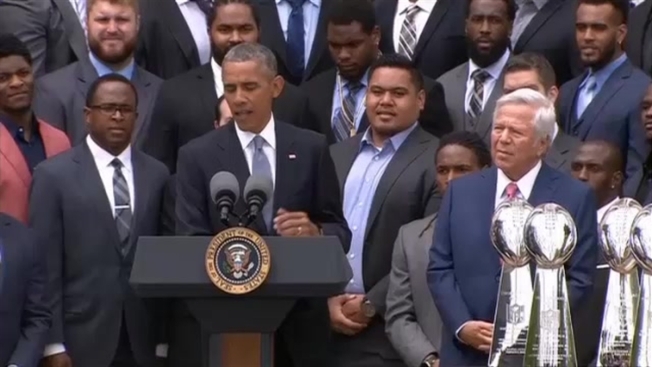 President Barack Obama is honoring the New England Patriots for winning the Super Bowl despite a "huge distraction and media circus." Obama recognized the football champions Thursday during a White House ceremony on the South Lawn. The president said "that whole story got blown out of proportion," referring to an investigation of underinflated footballs, as the crowd chuckled. Continuing to honor sports teams for their community service, he thanked the Patriots for visiting hospitals and schools in their community and wounded veterans at Walter Reed Medical Center. Head coach Bill Belichick presented Obama with a Patriots jersey and signed helmet and called him the "ultimate Patriot," despite Obama's allegiance to his beloved Chicago Bears. The Patriots defeated the Seattle Seahawks 28-24 in Super Bowl XLIX.